Bud Walrod had never seen anything like those disappearing junkers. Call it salvage, or call it “dismantling,” Bud had dealt with junk for 40 years and knew that nobody wants to hear about wrecked cars. Lately though, those heaps had been disappearing from the yard leaving nothing behind but puddles of safety glass and strips of chrome. 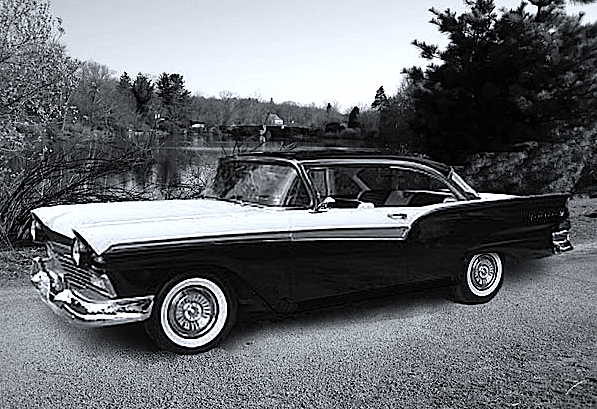 The first one, a 1957 Fairlane, had belonged to Richard Rhodes, After high school, he'd gone to work driving one of his Uncle Dusty's big dump trucks. I-80 was going through north of town, and there was plenty of overtime. Richard saved and saved and finally bought his dream car, a black and white two tone Fairlane with FordoMatic three speed and 292 T-bird V8. He loved cruising that 57 around south county roads drinking cold PBRs from a cooler on the back seat, listening to top 40 radio hits with his pals. But late one Friday night, when he'd dropped off his buddies and was on his way home, he'd fallen asleep at the wheel and rear ended a girl. Betty Johnson'd just finished a late shift at the 169 Diner a couple miles North of Walrod's. She'd served Richard and his pals cheeseburgers and fries only an hour earlier. The crash had whiplashed her head onto the steering wheel breaking her neck and killing her instantly. Richard had walked away untouched and sober. They towed both cars to Walrod's and parked them side by side in the yard. Bud had hosed out the Johnson girl's Belvidere although there'd been no drop of blood. Richard never drank or drove again. After the Ford's disappearance, Bud reported a theft to the Sheriff's office, but the case produced no lead, no evidence of theft, no suspect. A couple weeks later, when the next car vanished, Bud had heard a big wind out in the yard and thought he'd seen something like lightning, but low to the ground. The disappeared, a little four door Nova, had long ago belonged to Bud's classmate, Lynn England, who'd driven it in high school. She'd been a sweet quiet kid, dark skinned with straight hair, a slim, pretty girl. A boy in Bud's class, Michael Schmidt, had fallen in love with her and she with him. With Michael at the little Chevy's wheel Lynn rode scooted over close to Michael on the Nova's bench seat so she could rest her head on his shoulder. Lynn soon ended pregnant. Her parents sent her somewhere for the abortion, Wisconsin maybe, and Michael joined the Marines. He disappeared near Hue, just after his deployment in Viet Nam. Bud remembered now, that it had been Michael who'd painted the bright red racing bar on that Nova's hood and roof and trunk... the faded stripe still visible when the car vanished. This time, when Bud reported the incident, the Sheriff acted skeptical. He'd liked to have proven malfeasance, an insurance scam. But junk yards carry only liability, and that mainly against cases of tetanus. There was no motive, nothing to prove. By the time the third car disappeared, Bud had noticed sudden lulls in the breeze, rain microbursts from otherwise blue skies, cold humid calms that trailed him around the junk. And Bud had felt an emptiness that he, a very simple man, had never known, a vacuum that sucked out his being, leaving a pit in his stomach leaving him nothing, knowing nothing but nothing. The third car disappeared had belonged to Mrs. Dolores Carter, the Minister Charles Carter's wife. Mrs. Carter had often cried in church over Paul's imprisonment and had often quoted Isaiah 56. On her way to K-Mart one day, she'd wrapped her 1962 Dynamic 88 around a telephone pole after suffering a brain aneurism. Bud got a good price for its Rochester carb Olds Rocket motor. But no one ever knew whether it was the aneurism or the collision that had killed her. The night that 88 disappeared, Bud had watched talk shows until midnight, then turned in. He thought he must have been asleep an hour when a shaking and rumble from somewhere below awakened him. He'd guessed this must be an earthquake, like they have in California... some kind of earthquake. But then there was that cold calm again that trailed him to the door. And once outside, he saw a light moving under the cars out in the yard, illuminating the earth from inside as if the ground were translucent, an intense blue light that grew brighter and brighter as it moved ahead and reached upward. When it stopped at the Oldsmobile, lighting the wreck from below, the rumbling ceased, and the air went dead calm and thin, as if all oxygen had been sucked from it, and Bud, watching from only a few yards away, felt light headed. When the illumination finally broke through the earth, blindingly blue, an intense calm and peace settled over Walrod Junk, over the wrecks, over Bud... with nearly pure silence in the yard. Then, as the light faded, and the air returned, parts of the Oldsmobile reappeared, a rear brake lens still glowing red, a license plate holder, a bit of upholstery. But all else was gone. Bud stopped on the way back to bed for a drink of cool sweet water, the finest water he'd ever tasted, and then he slept the deep refreshing sleep of the innocent and the clean. In the morning, he thought of calling the Sheriff again, of reporting what he'd seen, what had happened, but decided against it. After all, he felt fine. He felt good. He knew he'd be OK. He knew how to keep quiet. Bud Walrod knew how to shut up about tragedy and wreck. Check Isaiah 56, if you like. I'm not sure why I keep looking for these Bible verses. This was published in Cameroc Press. Beautifully written, Steven, line after line. Bing-bang! Perfect verbal capture of the actions here. There's a kind of grace that infuses this story and gives it a calm gravitas. It has a Spoon River flavor to it but is a fine piece on its own. I'd like to read more stories linked to these. Well done. Damn, Steven! What a well-done story. Fave. Artfully rendered narrative, Steven. Tension maintained enough to be intriguing, but not threatening. Sentences clean and rhythmic. Story of each car extends connective tissue. Isaiah 56 makes sharp punctuation in a great spot. Ending edges on magical realism. Like this a lot. Thanks everyone. You're a list of respected writers (by me), so this all is very encouraging, and James Claffey, I'm going to get you ;) .